Spring is here, and with it lots of pink and pastel flowers for the garden and my vase. Looking around I have blossom on the peach and almond trees, the last of the daffodils and hellebores and the very first ranunculus! I've been filling my vases with more excitement than usual because I have a new book that's inspiring me greatly - more on that in another post. How's your garden blooming this spring/autumn? Are you growing any flowers for picking? Middle image: hyacinths in vase. 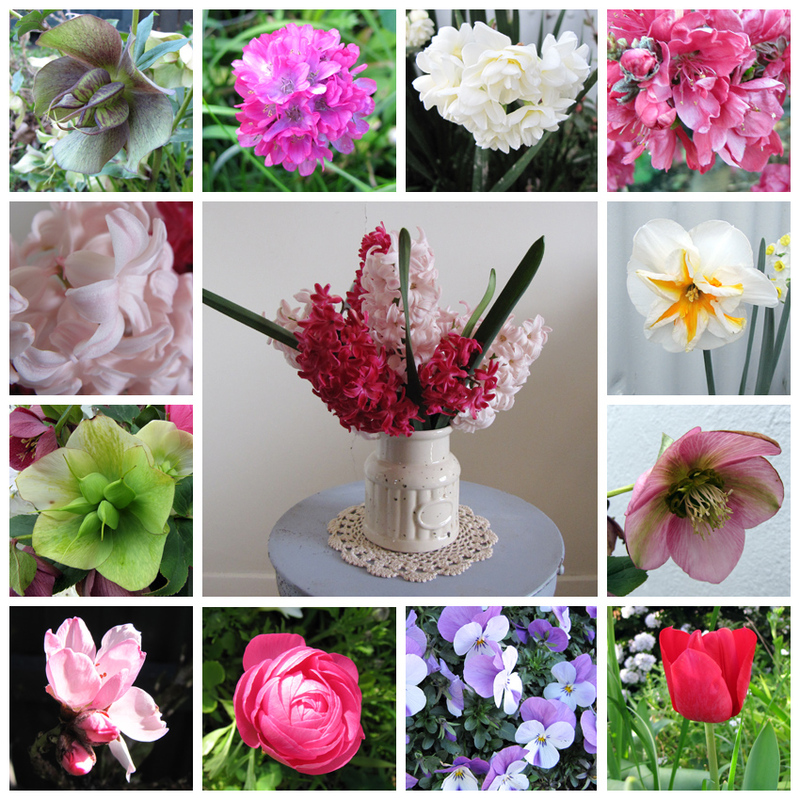 Outer images, clockwise from top left: sculptural hellebore forming seed pods, armeria, earlycheer daffodil, peach blossom, unknown but pretty daffodil, Pink Lady hellebore, red tulip, violas, the first ranunculus of the season, almond blossom, another sculptural hellebore, hyacinth blossom. Linking up to Garden Bloggers' Bloom Day at May Dreams Gardens. Thanks for your visit! Your comment made me smile! You are so right - you can never have too many vases! !